April 13, 14, 15 --3:30 p.m.
We will start with an introductory lecture on large Deviations. We will describe the general theory and illustrate it with many elementary examples like Cramér's theory for sums of independent random variables. Then proceed to Ventcell-Freidlin theory of perturbations of dynamical systems. We will then go on to describe more complex situations involving interacting particle systems and random walks in random media. Finally we will explore certain large deviation properties of random graphs and random matrices. Sathyamangalam Ranga Iyengar Srinivasa Varadhan is an Indian-American mathematician born 2 January 1940 in Madras (Chennai), Tamil Nadu, India. He received his undergraduate degree in 1959 from Presidency College, Madras, and his doctorate in 1963 from the Indian Statistical Institute under Calyampudi R. Rao, who arranged for Andrey Kolmogorov to be present at Varadhan's thesis defense. Since 1963, he has worked at the Courant Institute of Mathematical Sciences at New York University, where he is currently a professor. 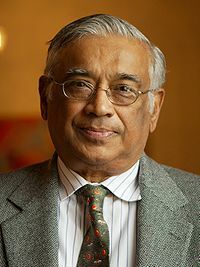 Varadhan is known for his work with Daniel W. Stroock on diffusion processes, for which he received the Steele Prize from the American Mathematical Society in 1996, and for his work on large deviations with M. D. Donsker, for which he was awarded the Abel Prize on 22 March 2007 by the Norwegian Academy of Science and Letters. In 2008, the government of India awarded him with the Padma Bhushan.